Question: Mark, I visit HomeAdditionPlus.com frequently as it is loaded with good home improvement information. One thing I couldn’t find on your site, however, is in regards to a question I have on whether or not you should install kitchen cabinets before or after installing wood flooring. I’ve received conflicting advice on what I should do. The kitchen cabinet installer told me I should put the kitchen cabinets in before the wood flooring to mitigate water damage to the wood floor in the inevitable event of a water leak under the kitchen counter and cabinets. Another person told me that it’s best to install the kitchen cabinets after installing the wood flooring. I was hoping you could weigh in with your thoughts on this question. It would be much appreciated. Thanks in advance. Answer: G.H., Installing wood floors in kitchens certainly comes with some justifiable apprehensions and fear, and water damage is a major one. In addition, kitchen floors are heavily used and take a lot of abuse, particularly if the kitchen is a major entry point into the home. Also, kitchen floors have to contend with heavy objects occasionally falling on them, such as the frozen piece of meat, silverware, glasses and plates. Nonetheless, many people still install wood floors in kitchens on a regular basis. Wood floors can provide incredible beauty to a kitchen. Depending upon the hardness of the wood type they can also be quite durable. They can also be refinished if they eventually become significantly marred. In regards to your specific question on “should kitchen cabinets go in before or after wood flooring”, this question stems around water damage concerns. It’s a legitimate concern. However, with proper preventive maintenance on plumbing fixtures and kitchen appliances you should be able to mitigate the risk of water damage to your kitchen wood floors. This said, I would recommend installing the wood floors first. I make this recommendation for a few reasons. 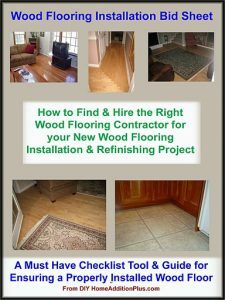 First, you’ll save on the wood floor installation costs. The wood floor installers will be able to more quickly install the wood floor because they’ll have fewer cuts to make, as they won’t have to work their way around the perimeter of the cabinets. Second, they’ll also be able to do a better job of installing the wood flooring by simply having to trim the ends along the wall line. In addition, due to the extra room to work and fewer cuts required, the boards will be installed tighter together, making them less prone to water penetrating down and underneath them in the event of a small leak. Third, in the event of a leak under the kitchen cabinets, normally the water damage is limited to directly underneath the kitchen cabinets or very near to them. If the leak is limited right underneath the cabinets, then the affected boards may not need to be replaced as they are out of site. If in the event some of the boards are damaged near the kitchen cabinets, then the repair is limited to just that area. Finally, installing the kitchen cabinets before the wood flooring effectively buries the cabinets ¾ of an inch into the finished floor. This doesn’t sound like much, however if the cabinets are not tall and you and your family are, it can be an annoyance to have the effective lower height cabinets. Many kitchen cabinet installers would prefer to see the kitchen cabinets installed first, because it’s easier on them. If the wood floors are installed first, they need to be more careful not to damage the wood floors. With a little upfront preparation, e.g. installing protective paper over the wood floor, and being a little careful they should be able to install the kitchen cabinets without damaging the wood floors. So install your new wood floor before installing the cabinets and enjoy your remodeled kitchen.